Polyphenols are mostly located in the skin (Epicarpo) of olives, whilst Tocopherols are located in the pits. 2. They reduce Cholosterol LDL by oxidating it. This is different from medicine based LDL reduction which can create rigidity in the cells membrane and therefore Seratonin can be damged therefore developing depression. There are two types : Tocopherols from seeds and Tocotrienols from leaves. The former are the best from the wellbeing standpoint. 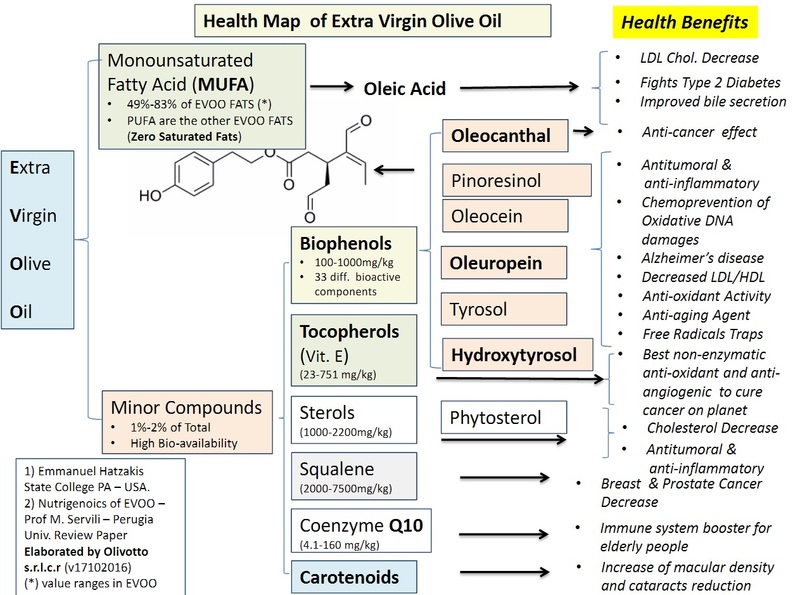 Olive Oil is by far the best source of Vit E in form of tocopherols (α-TOH) in modern diet . α-TOH is the best known non-enzymatic anti-oxidant of cellular membranes. This molecule is considered by European Security Food . EFSA an “ ESSENTIAL FACTOR”. Therefore with 26g of family-made extra virgin olive oil (less than 2 table spoons) you get what you need. We mean Family-Made has the content of α-TOH can vary from 23 to 750mg/kg depending upon best olives practices adoption. In the Olivottoil case 1.5 table spoons are enough. The excess of vit E is easily ejected by the body. Now the picture to the right is taken from TED's talk of Dr William Li. Dr Li claims that the best way to prevent cancer is with a diet which blocks blood vessels growing uncontrolled ( anti-angiogenesis diet). Look at the pivotal role of Vit E. Do you agree now that EVOO is a miracle food ??? For detailed health benefits see the Health Map on the right. They can reduce blood high pressure by 8 mmHg after 4 weeks of continuous consumption of two tea spoons (23 gr). MUFA is key to keep Cholesterol HDL in the range 40 to 70. The making of extra virgin olive oil comes about between autumn and winter, but it suffers from low temperatures. Below 8 degrees the triglycerides cristallization begins with the formation of suspended solid whitish crystals in the bottles that disappear when room temperature returns. You can find here a comprehensive research study on the many health benefits of the polyphenols compounds of Olive Oil.